Finally. FINALLY! I have finally read Tana French and yes, I feel complete. I might be a wee bit dramatic, but how lovely was it to read this psychological thriller with a narrator who tells you right off the bat that he's a liar, combined with a new homicide that pulls in a twenty-year-old cold case with no identifiable killer? Reading this confirmed what every reviewer said about it. Fantastic! It was a delightful trip to Florida last weekend as I was immediately consumed by this creepy story. First in the series for the Dublin Murder Squad, Tana French has obviously knocked it out of the park on her debut published in 2007. Opening with a horrific event from 1984, three children set out into the woods near their home for an afternoon of fun in Knocknaree, Ireland. Only one boy returns. Rather, he is discovered after a fearful search, catatonic and against a tree in complete distress, his eyes seeing something no one else witnesses, unable to share what happened to his two friends. Twenty years later, that young boy, Rob Ryan, has grown up into a police homicide detective. Still unable to recall any of the events of that fateful night, Rob is partnered with Cassie, a new homicide detective into the group, and their pairing brings them to the discovery of a missing child, found near the very same woods in Rob's hometown of Knocknaree. Could it be the same killer? As Rob and Cassie delve into the case even further, Rob dives deeper and deeper into the case, to the point of sleepless nights and too much alcohol. When he begins to see things, confused events that blend with past memories that are just now starting to come out, even his trusted partner Cassie begins to feel a trickle of doubt. I don't think I can do this book justice and convey eloquently how incredibly caught up I was in this story. French's writing is what brings psychological thrillers to the next level, and each characters' story is delivered efficiently, yet with striking prose, and I know I would be remiss if I didn't pick up her next books immediately upon release date. The strength of this story is not just in the chilling plot itself, but more with French's characters, each of whom have a past to contend with. Partners Rob and Cassie are an incredible duo, and certain events they experience throughout this case simultaneously made me giddy with glee and heartbreakingly devastated. What a fearless and fierce debut! There's no question I will collect Tana French's first edition hardcovers to put on my shelves for permanent safekeeping. And as much as I love horror stories (I listened to the audiobook for The Exorcist, for cryin' out loud), there were several sections in this book that I actually found much creepier (which I loved, by the way). Tana French delivers a powerful debut, a mystery mixed full with psychological conundrums and beautiful writing, with the final pages resulting in a combination of sadness for its end, and anticipation for the next in the series. With a brilliant story and characters, and a questionable ending which can only be served by following the series, this intelligently told tale will keep you engrossed in its pages long after closing the book. FTC Disclosure: I purchased the book two years ago. 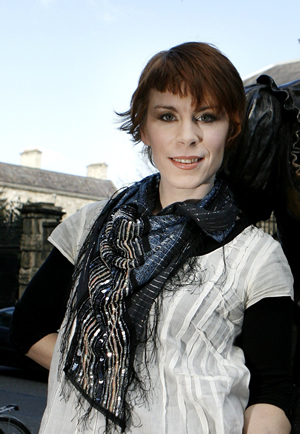 Tana French is the Edgar Award winning author for In the Woods and the author of The Likeness, Faithful Place, and Broken Harbor. She grew up in Ireland, Italy, the US and Malawi, and has lived in Dublin since 1990. She trained as a professional actress at Trinity College, Dublin, and has worked in theatre, film and voiceover. Have you read the other books in the series? I enjoyed this book, but HATED the ending, and based on a little Google searching, it sounds like the unsolved piece at the end is never wrapped up. That was the one thing that made me feel lukewarm about this book. I stayed up reading until 2:00 am only to feel like I'd been plopped into a cold tub of water. What a cruel way to end a book! I am listening to this one with my hubby right now!! I have only gotten to the first half, but it's so, so good! I love Tana French, and I can't wait to read The Likeness, which the wonderful Jenners sent to me!! I remember when I bought this book, reading the first chapter and then calling a reading friend and reading it out loud to him. I told him: THIS marries good mystery and excellent writing. I thought it was phenomenal. The Likeness wasn't a favorite, but I LOVEDDDDD her newest. Absolutely chilling. Many people do hate the ending because it isn't wrapped up. But see, this is why I love French so much I'd have her children. She has balls. She doesn't ever take the easy road. Very rarely does life wrap itself up in a neat little bow. What I also love about French is the chemistry she creates between her characters. it is like a living, breathing spirit that comes right off the page. All I can say is this...read them all, and savor them. Girlfriend does not write fast enough. I have her newest -- Broken Harbor -- which I understand can be read 'out of order', so to speak -- I'm dying to because everyone raves about her books. I need to get this one, stat! Welcome to the Tana French fan club! Hope you will continue to love her fantastic thrillers. Oh, and I love the picture! I hope you were able to relax despite the creepiness! I have been meaning to read this one for years now and can tell that I have been missing so much! I just brought this book home from the library! I LOVE Tana French. I'm reading Broken Harbor now. The Likeness is my favorite, but I really appreciate the world she creates, so I would never recommend one over the others. The way I found Tana...I purchased In The Woods for my mom for Christmas and I started reading it before I gave it to her. I gave it to her and then asked if I could take it back so I could finish reading it. Fortunately, I have a lovely mom and she let me have her Christmas present until I was done. Wow, what a thorough review! I read this book last year, and you sum up my own reaction very well. This was a really smart, really well written, and really creepy book. 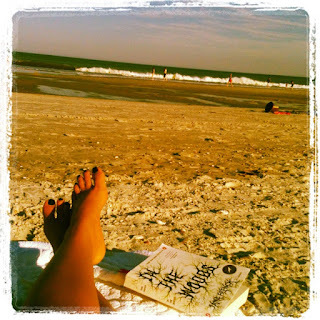 I have The Likeness on my Nook, and this review reminds me that I need it read it soon. Thanks for a great post! Yay! So pleased you've finally read Tana French and that you love her as much as we do! I liked Broken Harbor so much, I must go back and read the other 3. Wasn't it so good! I just can't wait to read the rest of the series now. I know what you mean about the creepy level too. So creepy, but so good! I really liked In the Woods but haven't read her other books yet. I need to read Tana French still. I'm sure her debut is likely the best place to start. Nice review! I really want to read this, good for you even after 2 years. 500 has became my law against chunksters,lol, but I may dismiss it to try this one. Must read SOMETHING of hers. Must! I haven't read her yet either! I've really been thinking of picking this one up soon to jumpstart my reading again and I think I am really wasting my time not getting to it right away!! Thanks for this post - I am going to put this book on my reading list! I loved this one as well when I read it a few years back. I've been meaning to read more by French every since then but unfortunately I haven't. I'm going to remedy that next year for sure! I'm even hoping to go back and reread this one just because it has been such a long time since I read it. Great review and I'm glad to hear that you enjoyed it as much as I did!